It’s been 17 yrs. since I last trained a Chow pup. In hindsight I can see the mistakes I made. Today the internet has opened up a flood of information & misinformation on every imaginable subject, including dog training. I haven’t completely sorted what’s what yet, but I want to share what I’ve learned so far and include new material & insights in the following months. I’d appreciate any training material suggestions, especially during this first year. There’s so much on YouTube that you can spend days sifting through it all. Some material is from well known dog trainers like Cesar Millan & Victoria Stilwell. The two I’ve found most helpful are not nearly as famous. Their videos are short & fairly well made. Both follow the purely positive reinforcement training philosophy. Scroll down to their “playlist” section for a collection of their basic training videos. I’ve only read 2 books (halfway through 2nd) so far. In both cases they use a “hybrid” training method that incorporates limited disciplinary techniques to go along with the mostly positive reinforcement concepts. The broader philosophy behind both books that I find most compelling is the emphasis on developing a bond/relationship between dog & person. There are many more books, so this is just a starting point. Book titles, like news headlines, tend to be splashy. The books were better than their titles. Check your local library. My last source of training material is not free. 17 yrs. ago I went the pet store route for puppy school. It was somewhat helpful, but the young trainer clearly was not a “professional”. This time around I was more selective. We’ve attended 2 play sessions and 1 class, with 4 more weeks of Thursday play/Saturday class to go. The main advantage is the professionally supervised interaction between other pups and people (including kids). I think this is very important during the 8-15 week age range when the pup is still quarantined from public spaces. The main trainers in this particular dog school are regularly observing Thor and I expect to be able to ask them specific questions when issues arise. Meanwhile we have our homework assignments. It’s a learning process for both of us and the extended family. Drew, the petshop training programs are for you, not the dog. The only benefit to the dog is the socialization aspect. If you know the basic verbal commands, the appropriate hand signals, and understand the reward program, thn puppy class isnt going to really offer a whole lot. With a Chow, as long as you understand and can enforce the leadership chain, most things will go according to YOUR plan. Yes, you need to establish you place as the pack leader. Yes, you MUST do that without negative consequence. There can be no hitting or threats. As far as Caesar Milan is concerned, i believe he has only tried one Chow. And it didnt go so well. His methods attempt to bully a dog into submission, and no wonder he failed. Chows require equal parts of respect and motivation. 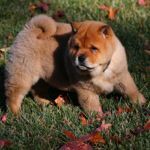 A chow will not head up a flight of steps unless he sees reason to do so...whether that is your affectionate petting and a 'good boy', or a food reward varies depending on the individual dog. But you cant drag him up the stairs and expect good results. I do strongly recommend getting your well behaved pup out in public. After he has the basic dog commands down (sit, lie, down, off, leave it), then he needs to visit everyone one or thing possible. Sure, take him back to that pet store on lead. Let him meet all the kids, parents and seniors in the store. Let the Chow check out the bull mastiff, the GSD, and the pom that are shopping. Good manners should be enforced, but if he has the basics down it should be no problem. Rory's Dad wrote: Drew, the petshop training programs are for you, not the dog. The only benefit to the dog is the socialization aspect. If you know the basic verbal commands, the appropriate hand signals, and understand the reward program, thn puppy class isnt going to really offer a whole lot. Yes, the supervised socialization is definitely the critical aspect for the class & play times. I probably won't learn much that I don't already know about actual training techniques, but I'm assuming that these particular professionals with Certified Pet Dog Trainer (CPDT) standing will have insights specific to my pup. With a Chow, as long as you understand and can enforce the leadership chain, most things will go according to YOUR plan. Yes, you need to establish you place as the pack leader. Yes, you MUST do that without negative consequence. There can be no hitting or threats. As far as Caesar Milan is concerned, i believe he has only tried one Chow. And it didnt go so well. His methods attempt to bully a dog into submission, and no wonder he failed. I realize this topic is nearly as flammable as religious or political discussions, but hopefully we can still share opinions & thoughts openly. Clearly I want to avoid "negative consequence" techniques and stick to positive reinforcement, but I'm not entirely convinced that's always possible. I'll describe some "negative" moments in a separate post and let you all tell me if I went too far. I know that my good intentions won't always prevent me from making mistakes. I do strongly recommend getting your well behaved pup out in public. After he has the basic dog commands down (sit, lie, down, off, leave it), then he needs to visit everyone one or thing possible. Sure, take him back to that pet store on lead. Let him meet all the kids, parents and seniors in the store. Let the Chow check out the bull mastiff, the GSD, and the pom that are shopping. I plan to do all that once he has completed the vaccination series in 2 weeks. Despite limited forays into public grounds, he's actually met a good range of people & pups. I look forward to expanding that in a couple of weeks. I live in a university town and walking around campus with a Chow puppy ensures many admirers. The problem will likely be him becoming impatient with too many people wanting to hold or pet him. But if I recall correctly, that problem solves itself once he grows larger and looks more formidable. Right now he looks like a miniature fluffy cougar or bear. Here are some of the basics that we’ve worked on during the 8-13 week age range. I’m still not sure what sequence is best, but each pup is different and they’re all pretty adaptable. Thor’s breeder started training things like bite inhibition early, so we didn’t need to work much on some things. I’m sure I’ll discover things that I wish I’d started sooner. I’m using an enthusiastic verbal “Yes!” instead of a clicker, but I’m wondering if a clicker might be even better. • Play bark/hyperactive state when tired and ready for sleep. I’m not sure if this was the best method, but I stood tall with my hands on my hips and exuded as much displeasure as I could while firmly saying “No!”. The first time I did this he persisted to bark & attempt to nip until I took an aggressive step & practically growled at him. He retreated to a distant corner and slept. He avoided me for 1-2 hours even after he woke up. I can’t tell you how badly I felt at this point. I thought I had emotionally scarred him for life and that he would never trust me again. But subsequent No! warnings received a quicker response without the long avoidance period. I also added the universal hand-with-palm-out “Stop” signal along with a verbal No! This now results in almost immediate sleep a moderate distance from me. Several minutes later he will quietly approach me, sit at my feet and continue his nap. • be mentally & emotionally prepared: calm-yet-cheerful attitude, assertive, patient. We may roll our eyes at all the "energy" talk, but dogs are very sensitive to the emotional vibe we project. • keep it brief: 1-2 min. training sessions at first. Pups are easily distracted. I’m using treats to condition (think Pavlov’s dogs) positive behavior. Those treats will be phased out very gradually. I count treats as part of his overall food ration. I bought a few bags of healthy treats, but he loves chicken & turkey more. I roast chicken regularly, so will leave a portion salt-free for treat production. Each treat is smaller than a pea. A 4 oz. ziplock bag will last a couple of days. Thor didn’t get “Down” until I used a very exaggerated gesture: palm down, sharp movement downwards to floor. • loose leash walking: currently just walking around with random direction changes, luring him with treats and keeping leash loose. It's to get him used to the leash without any negative connotations. • Potty indoors: limit living space, feed regularly, limit water at night (remove water bowl after 8PM? ), take outside to “go potty” immediately after waking up, 15-20 min. after a meal and before naps. Immediately clean accidents thoroughly, but don’t punish or even make a fuss about it. • Bite inhibition: give alternative chew toy (have a variety of materials handy). Play with pup using the toy instead of hands alone. If he does nip (even accidentally), stop play and walk away for a minute. I’m sure there are more detailed steps on bite inhibition, but since Thor was already pretty good I didn’t research further. • Negative interrupter (chewing on furniture, begging for food, barking, etc. ): use a spray bottle on stream setting. Try to not let pup see the source. I only needed to use a few times, then "uh uh” was enough to remind him. This even worked to stop him entering carpeted areas in my brother’s and sister’s homes. i wouldn't consider any of that out of bounds. We definitely can get frustrated with our pups. It doenst always go smoothly and there are going to be hiccups in the process. Sure, some of that can be a translation issue (Chows don't speak English as their native tongue). A firm NO, is a requisite whether out of frustration or not. My input is more towards the line of pulling, wrestling, or nose slapping. That definitely won't have good results. Verbal commands, even if they result in a stand-off are going to happen, and may even be positive in the end. You are establishing your position. He is getting it, as his reaction shows. I actually like the spray bottle for chewing if he doesnt respond to verbal command to stop or leave it. It offers an attention getter, and is not really all that physical. Potty accidents? You have a good approach. "Rubbing his nose in it" approach does no good. I agree, ignore it and move forward. Clean up can be tough, hard to get rid of all the 'evidence', but still is the way to go. My dogs are intact, and the male has a natural instinct to mark everything. And i mean everything. We have gotten him to a point where he will ignore almost everything that isnt vertical (poles, fences, shrubs, etc). • Play bark/hyperactive state when tired and ready for sleep. I’m not sure if this was the best method, but I stood tall with my hands on my hips and exuded as much displeasure as I could while firmly saying “No!”. The first time I did this he persisted to bark & attempt to nip until I took an aggressive step & practically growled at him. He retreated to a distant corner and slept. He avoided me for 1-2 hours even after he woke up...I can’t tell you how badly I felt at this point. Just a quick update on bad behavior. A firm "No" or "Uh-uh" in a low tone is enough to stop him doing something he usually knows he shouldn't be doing. He's still a pup and will push boundaries, but he now knows me well enough to sense when to stop. Specifically on getting hyper before sleep: now that we've started walking, the regular exercise helps avoid the settling down issue. The basic routine is: wake up, walk, play, eat, chew on toy while being groomed, sleep...repeat. All puppies, wild or the domestic, love to play; you can capitalize on this by making play sessions with your pup part of her training. Play conditions your pup to be enthusiastic about learning to enjoy being with you. By mixing training with games, you can bring out a healthy attitude in your pup that will carry over to conventional obedience work when she is older. • Chase without ankle biting: something interesting tied to a rope (dry fern leaf, chew toy, etc. ), then run. The pup will almost always chase. Once he catches the object, tell him to “sit” or “leave it” and reward with treat. • Tug: rope toy or something similar. Gently play tug for 30-40 seconds, then “leave it”. Reward with treat or start play again. • Fetch (yes, a Chow will fetch…at least for a little while): prepare really good treats for this one. My pup likes squeaky toys for fetch. As soon as he starts running back to me I say “yes!” and encourage him to continue coming to me. Use a long lead if you try this outdoors in an unfenced area. • Hide ’n Seek. Good practice for “Come here!” I do this randomly whenever we’re in the backyard. I make a small noise if he needs a clue. Again, high-value treats ensure he’ll come looking for you. • Jump (through car tire, over a small box, etc.). If you have space, set up a series of jumps. Although not really "play", grooming and massage are good ways to build a closer bond with your puppy. In the long run that makes training easier. My pup seems to enjoy being groomed while he's settling down with a bully stick or some other chewy. Well, crate train your puppy. It helps in the potty training. Teach your puppy to "come" by giving a treat. Teach"no" by using a loud voice. We use "no bark" and "take a pee" which they have learned to do on command. Take obedience class, they are a good start and also provide socialization that is important. Depending on dog, the are agility trials and we even have Wiener Dog races here. There are lots of dog opportunity. Many places have dog parks. Proper feeding is very important. Also regular grooming.